Loving the hustle and bustle of a new academic year! I don’t know about you, but even though classes don’t officially start until next Tuesday, 9/8/15, at Mott, things are really hopping here on campus. It’s Kick-Off Week at the college, and faculty who have been away doing whatever it is faculty do (which – believe it or not – is a lot!) are converging on campus to celebrate the start of the new academic year. Although it has its moments of stress as things gear up, I love all the new energy bubbling around campus! Our campus has been very busy with a number of initiatives over the summer, many of which have involved faculty in the development of Guided Pathways. If you’re not familiar with this topic, here’s the short version: Guided Pathways involves a multi-faceted approach to helping more students graduate, but beginning with the development of clear, semester-by-semester outlines of how to move through an occupational program or transfer discipline. To support this, other areas of student support are addressed including intake, orientation, advising, etc. It is an effort to use best practices supported by data to lay a strong foundation for success as students enter, progress, and complete their time at the community college, culminating in a degree or certificate. Some background reading can be found here and here, lead by Rob Johnstone and Davis Jenkins who are considered among the leaders in this movement. Another big project was taken on by myself and a colleague, Jim Shurter, far outside of our regular duties, in the form of a marketing campaign for the college. “Mott. My Path to Excellence.” – The tagline and campaign aimed to reposition our college as a “first choice” in the Greater Flint area and surrounding counties, and not simply a more affordable one. We used the voice of millennials to speak for what they wanted from an education, and how they wanted to shape it for themselves. The inference here is that Mott can not only help make that happen, but by choosing Mott over, say, a “name” university, we have redefined the community college as a truly valuable option that is on par with their other choices. We are empowering these potential students to say that Mott really IS their path to excellence! Now… for some of you, it may have occurred to you that these two initiatives are at odds with each other. Why would we create Guided Pathways that seem to “remove” choice, and then seemingly try to entice students to Mott as a way of shaping their own choices in education? Believe it or not, it makes sense when you look at how many of our students want those choices in the specific educational program they’re choosing to be determined. Today’s students, according to the research by Jenkins, et al, want a more defined path to get them to their destination. But these pathways are not rigid and inflexible. When it comes to non-CTE programs, they are simply a guide to help make the most of their brief time here before transferring to a university. The other part of the Guided Pathways Initiative depends heavily on advising and a case management system that would involve faculty and others in working with students to help guide them towards their goals. In this way, exploration is still possible for the student who wants to veer off the proscribed path. As for the campaign itself, it seems to have touched the audience effectively. Rather than the 7% drop in Fall enrollment that was originally anticipated, we are currently hovering at around 3% above last year’s Fall numbers. I’ve run into many new students in the out-county areas where we were especially focused who – once they learned I worked at Mott – have proudly announced to me that they were starting there in the Fall. It was exciting to hear! Now, as we launch the new academic year, I see our CTL as playing a vital role in helping our college employees help support that message that we are all here to help students make their future possible! To our Mott employees, alumni, and students, be sure to share your story using our hashtag – #mott4me! Here’s to a great semester for everyone! Diversifying the student body is on the academic radar when examining the student population at colleges and universities across the nation. But diversity is not just about race. It involves the whole sector of students we see on the campuses of community colleges across the nation. These students may include ones who are first generation college students, ones who dropped out or were not encouraged to continue their education beyond high school. It includes students who come from poverty, crime-ridden urban areas, or depressed rural spaces. It may include working adults returning to school to try and improve their income potential, a stay-at-home mother who needed to develop job skills to return to the workforce, or the factory worker whose job was outsourced to China. And it also includes students whose parents may be concerned about their child’s ability to stand up on their own far from the family support system. Whatever the reason that brings a student here, community colleges provide educational opportunities for some of the most diverse learners in higher education. With that in mind, three recent articles are worthy of your attention and are shared with you here. This is an opinion piece written by Laura Huober who made the auspicious transfer from Santa Monica (Community) College to Amherst College, an elite private liberal arts college. 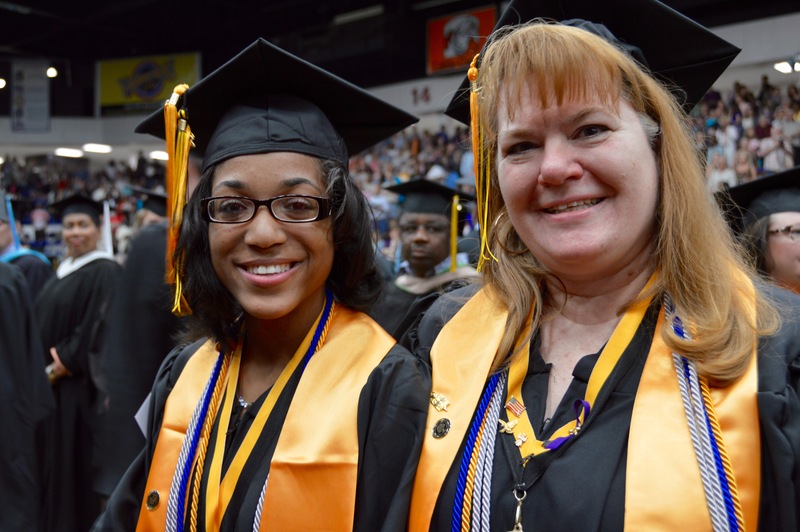 Her story demonstrates how, with the right supports, community college transfer students not only can thrive, they can make a valuable contribution to the learning environment. In this article, the First Generation student includes many who are also first generation Americans, as well as the first in their families to go to college. The article examines the tension regarding the stories of first-generation students who reach elite institutions, and the majority who are served by community colleges. In this article, Katherine Mangan addresses one of the hottest topics at the American Association of Community Colleges annual convention held this week – predictive analytics and retention strategies. What makes this article a good read is the recognition that numbers alone don’t tell us what to do and are only part of the equation on predicting success. Examining best practices, reinventing success strategies to work with our community college student demographics, and implementing them in a thoughtful way – these all help frame data as a reference tool to inform the choices made on how to support students. Those choices may include mentoring, i.e. creating a social connection to help support the student, addressing grit and other noncognitive traits that can make or break a student’s ability to succeed. Tools such as SuccessNavigator can help identify the characteristics that can undermine a student as they manage the intricate balance of academics and life. Ultimately, our success in Mott Community College’s Center for Teaching & Learning is measured by how we support those who make student success possible! As Faculty Director for Mott Community College’s Center for Teaching & Learning, I had a bit of a learning curve in order to fully embrace the role the CTL has on our campus. So I thought that with this entry in our blog I would share both the general idea of CTLs and how we have utilized this center at our community college. This is a conversation that usually begins when someone asks me where I work. In Summer 2014, I was offered the opportunity to be reassigned to Mott’s Center for Teaching & Learning on a fulltime basis. Previously, I served as the Program Coordinator for Graphic Design and a fulltime professor for the program that I had developed over 18 years ago. It was my baby and, just like a young adult, it needed a new direction which happily came through the leadership from one of my former students – now a fulltime colleague in the department. But to answer the question: What IS a CTL? That required MY understanding to grow as I, among many people on campus, did not fully understand the CTL’s connection to professional development. Although I occasionally attended events or offered a workshop through the CTL, I did not understand the center’s more comprehensive objectives and the role it played. I was truly ignorant of its potential utilization. Guilty as charged. What I learned was that the CTL at campuses across the USA have a variety of names, but generally focus on supporting faculty – new and experienced – in improving their teaching effectiveness in order to improve student success. It all comes under the heading of Professional Development. Everything is framed with two main goals: to improve ALL employees’ effectiveness in doing their job, so that ALL of us can work together to improve student success. I spent my first few months learning all about Mott’s CTL and what role I might play in its activities. Professional Development seems like such a formal and “enforced” activity rather than the organic nature in which a faculty member usually seeks to “develop” in their discipline, especially in the arts where my roots lie. But at Mott, the CTL does much more than offer PD activities for faculty. There is a concerted effort to reach out to staff from all levels across the campus for their PD needs, to provide a center for gathering for college employee conversations, and to create opportunities for enrichment that can help open up creative and innovative thinking for all of our employees, all of which will lead to improving our job effectiveness. At Mott, as I’m sure is the case at most community colleges, students, after all, are the reason we are here. The CTL at the community college becomes an effective tool for bridging departments and disciplines, creating peer-to-peer support, and introducing new techniques and learning theories that can help us with our most challenging students. At Mott, the CTL focuses on faculty and staff, bringing people together to share their expertise, discoveries, and insights in order to help each of us become more effective. We also host special events coordinated with other local higher ed institutions to bring in nationally recognized leaders in teaching and learning. These events are used to tip off a year-long conversation, additional workshops, and peer-to-peer explorations. To help offset the costs of these speakers, Mott is a member of a local Quad POD with three other post-secondary institutions who share in the planning and programming of these special events. To connect our work to students, we’ve utilized techniques such as a “Human Library” where individuals with historical and personal experience on an important topic share their stories and help bring history to life. Students attend as part of their coursework because their instructors have coordinated with the CTL to create an experience that will help bring depth and breadth to their learning. As a CTL at a community college in an urban area, we also facilitate Service and Experiential learning opportunities, including having a reassigned faculty member with leadership in this area. Not only do we offer support for faculty to incorporate S&E into their courses, we also coordinate with community organizations to involve faculty, staff, and even students for Service Saturdays. These special Saturdays can involve anything from building a home with Habitat for Humanity, to cleaning up the Flint Riverfront or Durant Park. And just because we are now into our “slower” Summer season for regular faculty activities, it doesn’t mean we have any fewer volunteer opportunities and participation. Beginning with a Volunteer Fair that occurred near the end of the Winter semester in April, we identified organizations that would fit well with the Service Saturday theme and have promoted these and other community events to encourage college staff, and the faculty still on campus, to be involved in the college’s community. In our regular 2014 Fall/Winter semesters, our Service Saturdays alone included over 900 man hours of volunteer time. Of course, the CTL at Mott offers a wide variety of workshops on technology and work productivity. We have reassigned faculty experts who are available to help their peers get the most out of our Learning Management Systems. Our staff IT experts use the CTL to share broader-based technology content, and there are occasional external experts who share their specific knowledge on a subject. As opportunities and interest arise, we connect with expertise in the community and region to offer training in everything from activities for personal enrichment, to new theoretical teaching models and their applications to improving student success. And, not to ignore health and wellness, the CTL provides a venue for workshops that improve the health and wellbeing of our campus community. The CTL at Mott is continuously updating their approach, scanning the environment for where we can best serve our audience – the faculty and staff of the college. Recently, after hosting a series of large task force meetings on student and employee experiences, we began to address those meeting outcomes in our programming plans for Summer and Fall. In addition, our college is part of the first Cohort in Michigan to implement Guided Pathways, and the CTL has risen to the challenge of providing support for that effort through workshops that help faculty and staff create and understand how to work with students using the Guided Pathways. The exciting part of working in Mott’s Center for Teaching & Learning is that it never stays the same. We have the ability to seek out opportunities to support all members of the college community in ways that can truly have a positive impact. Yes, it can be challenging to find ways to improve attendance amidst the hugely busy schedules of our audience. But that is but one challenge among many, one that we don’t take lightly and are continuously examining ways to deliver our services to help improve access for our programs. Whether we hit it right, or fail miserably, we try and learn from it. Our goal, however, is to be the best resource possible to support our college faculty and staff so that, ultimately, our students will be the true winners. That’s the best way I can think of to measure our success. Now Some Questions for you! Do you ever attend programs at your college’s Center for Teaching & Learning (or it’s name variety)? Are you involved in developing programs for a CTL? How does your CTL attract/schedule/plan in order to achieve the best attendance and effectiveness? Write back in the comments to share your thoughts about the questions above, or other things you’d like to share. You can’t be involved in Community College education without running into the external scrutiny that often comes with a new proposed solution to the challenges of teaching such a diverse group of students crossing the thresholds of our campuses. No sooner have we developed our latest version of General Education requirements when a new approach is before us, one that promises to move more of our students from struggling receptors of knowledge to gleaming graduates. Whether it is a focus on General Education, Disruptive Advising, Learning Outcomes, or Guided Pathways, the elements of creating a successful graduate are complex and highly variable. All of them contain merit and are worthy of our attention and consideration, especially when blended together in a thoughtful way, with input from all stakeholders and implemented in a balanced approach that still allows for flexible applications within individual student circumstances. The goal, after all, is not to eliminate variability. And it is not to eliminate the liberal arts in favor of more vocational work-preparation skills. The goal, at least as described by one college, was to create a series of outcomes that “modeled the core values of communication, critical thinking, and respect for diverse opinions” (Rodicio, 2014) which are hallmarks of good citizenship. 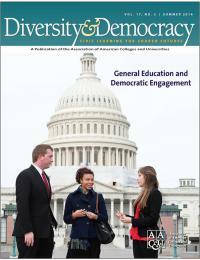 Rodicio, who is provost for Academic and Student affairs at Miami Dade College (MDC), and president of the Association for General and Liberal Studies, shares the story of their college’s transition in an article titled Modeling Democratic Practices through General Education Reform: A Developmental Journey. At MDC, the nation’s largest community college, faculty, staff and leadership have taken on this challenge. They’ve applied a very democratically designed approach in reexamining their general education requirements into a series of College Learning Outcomes. Responding to pressures to be more accountable for learning results, they began by defining the question: “What learning outcomes must our students achieve in order to become effective citizens an lifelong learners?” Their resulting goal as “democracy’s college” is both admirable and achievable. As they moved through a multi-year process that began with college-wide conversations across seven campuses and outreach centers, a series of events were held in such a way as to ensure involvement with faculty, staff, and students. They moved from developing a set of General Education Outcomes, eventually renamed College Learning Outcomes, and developing Learning Outcomes Assessments. Annual campus dialogues are held by faculty to review results and examine the implications they may have on student learning. In 2007, the college community “reaffirmed the importance of liberal learning in developing a well-informed citizenry in a global community” through a covenant which was signed by members of the college community, including representatives from students, faculty, college leaders, and the local community (Rodicio, 2014, Padron, 2008). Recognizing that different initiatives can be interconnected, Miami Dade College has more recently begun to implement guided pathways which they called a “Roadmap to Completion” in a pilot program that involved bringing together some existing resources into a more comprehensive support system. They believe that the framework that a more defined pathway not only may lead to more graduates, but it can also improve attainment of the broader college learning outcomes. Read the complete article that tells the full story, and find the full list of Miami Dade’s Learning Outcomes here. As we take this time to look back upon 2014, those of us who teach and work at community colleges may consider how much our work has reached the attention of the nation. The challenges posed in educating our students are not completely lost on observers and critics. But when focusing upon the statistics often featured at the center of official reports and white papers, it is easy to miss the narratives of the main stakeholders, the students and educators. A recent New York Times article highlights some of these challenges as told through the story of Dr. Eduardo Vianna, a psychology professor at LaGuardia Community College in Queens, arguably one of the most diverse community colleges in the nation. The article, “Raising Ambitions: The Challenge in Teaching at Community Colleges” by Ginia Bellafante and published December 19, 2014, reminds us of the important role our institutions play in educating nearly half of all undergraduates nationally. Even more so, community colleges see the majority of our students coming from the “lower half of the income distribution.” Along with this come many challenges in terms of the lack of preparation for college, including poor analytical and critical thinking skills. Yet those skills are vital to meeting the demands of economic mobility and growth. Many of us who teach at these institutions will recognize elements of the story from our own classroom experiences. Vianna shares how his students found it difficult to assess evidence from data posed to them that conflicted with their own assumptions. By way of example, he shares how he gave his students an assignment based on the work of psychologist Edward C. Tolman. The graph they were reviewing showed that rats could learn to navigate a maze without extrinsic rewards, yet the students could not see this and came to the opposite conclusions. To help prepare incoming students to meet the expectations of critical and conceptual thinking, many community colleges have begun requiring students to take a first year seminar course. The courses also connect students to faculty in their majors, another important aspect in student engagement, according to much of the published research. Community college educators are also leading the way towards facilitating learning rather than simply lecturing facts, involving students in more active learning and collaboration, and offering continuous forms of low-stakes assessment. These are all parts of the arsenal of techniques meant to improve student engagement. These and other pedagogical approaches are addressed in a forthcoming book “Taking Teaching Seriously: Why Pedagogy Matters! that includes contributions by Dr. Gail O. Mellow, president of LaGuardia Community College. At Columbia’s Community College Research Center, assistant director Melinda Karp suggests that in order to engage our students in academic discourse, a more constructivist approach may be necessary, one that involves more active and collaborative learning. These techniques have already been embraced by many community college educators. Bringing it mainstream requires sharing it college-wide. As we reflect upon the needs of our students, at the Center for Teaching & Learning at Mott Community College, as with similar centers at community colleges around the country, we understand the role of professional development opportunities in addressing the issues raised in the NY Times article. Just as with the students we teach, sharing among our colleagues about successes gained, while working through the challenges, can help community college educators – faculty and staff alike – meet the challenges of raising the ambitions – and ultimately the success – of the students we serve. With warm wishes for the holidays and beyond! Only about 9% of faculty surveyed in a recent Gallup study published by Inside Higher Ed said they would “strongly agree” that online courses have similar achievement levels for student learning outcomes compared to face-to-face courses. 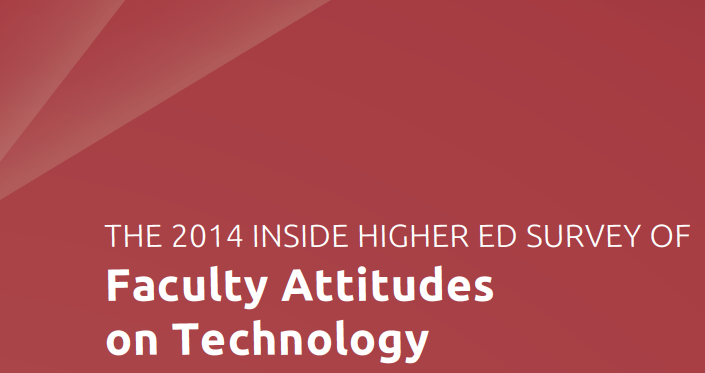 Titled The 2014 Inside Higher Ed Survey of Faculty Attitudes on Technology, the survey reveals an apparent disconnect between the attitudes of technology officers and faculty on how well online courses address 8 quality factors for online learning. 1) Ability to deliver the necessary content to meet learning objectives. 2) Ability to answer student questions. 3) Interaction with students during class. 4) Interaction with students outside of class. 5) Grading and communicating about grading. 6) Communication with the college about logistical and other issues. 7) Ability to reach “at risk” students. 8) Ability to reach “exceptional” students. In general, the authors reported that the majority of Technology officers rated these factors as being equivalent or better than in-person courses. Faculty were a bit more ambivalent indicating that only four of those quality factors might be equivalent for online courses to in-person courses. For instance, 50% indicated that online courses had the ability to meet learning outcomes that were the same for both formats. And 72% of faculty said online was the same or better than in-person for grading or communicating about grades. On the flip side, 77% of faculty responded that they felt online teaching had a much lower potential to reach at-risk students compared to in-person. For institutions such as Mott, measures have been taken to make sure that students who are identified as at-risk (i.e. lower GPA, attendance, placement test results indicating remediation) cannot register for online-only courses before addressing these issues. More than 8 in 10 instructors say they have converted a face-to-face course to a hybrid course. This may be in part because a large portion (78%) already use learning management systems to share some basic information such as syllabi, grades, and general communications. Just over half (51%) of faculty agree that more active learning – or what José Antonio Bowen referred to as Teaching Naked – can be done with the flipped classroom approach of blended or hybrid courses. In reviewing the data shared in the report, it is interesting to note a few elements that were not highlighted by the authors in their summary. For instance, 56% of the respondents fell between the ages of 50-69 with another 6% aged 70 and older. Among faculty, 49% were tenured while 31% were not on any tenure track. Among disciplines represented by faculty, a larger portion – 29% – identified their field with the Humanities, compared to 17% in Social Sciences, 19% in Engineering/Physical Science/Biological Sciences, and only 5% in Computer and Information Sciences. Among faculty 78% who responded were fulltime. Asked of the technology officers, they indicated that 85% of their institutions offered some blended or hybrid courses, and 73% offered online degree programs. The institutions that were represented in the survey represented a variety, including community colleges (26%), public four-year (26%), private four-year (43%) and for-profit (2%). There were no private two-year institutions represented in the survey respondents. While the results seem to portray a system that does not have full consensus, there is at least one area where the majority of faculty agree, early warning systems for students at risk of dropping out of their courses do help students. Based on other responses in the survey, and consistent with other research, the early warning system triggers a team response that serves to reach out to the student and provide some kind of intervention before they fail. Want to read more from this study? It offers some interesting insights into the role of online learning, faculty and technology officer perceptions, and learning outcomes. Download the full study here. Over 500 sources of data are now being brought together to create a new educational tool to follow the completion of community college students on national and statewide levels. The Chronicle for Higher Education recently reported about this new tool, called The Completion Arch, being offered by RTI International. Asking “What really happens at Community Colleges?” the new tool is intended to track community college students along five stages of their educational progress: Enrollment, Developmental Education Placement, Progress, Transfer and Completion, and Employment Outcomes. To make the tools more useful, the designers have made every attempt to use the latest data sources. For instance, I was able to pull the Fall 2014 data for the state of Michigan on some basic enrollment characteristics. In addition, when I pulled up transfer and completion for Michigan, it gave me graduation rates for first-time, full-time students. 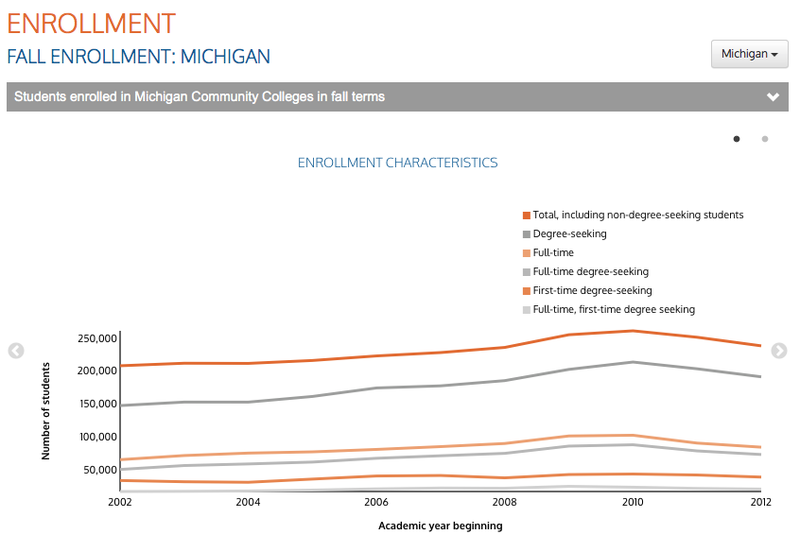 The data showed that among full-time degree or certificate seeking students in Michigan who started in 2009, about 15% graduated within 150% of normal time (2 yrs for Associates degree). As an aside from me: 15% is a low rate. But for those who work at community colleges, we know that full-time students who are “first-time” in higher education comprise a fairly low percentage of the overall enrollment. A larger portion are returning adults who stop in and out of higher ed, are attending part-time while balancing families and jobs. Their completion rates would be better considered over a 200 or even 300% of “normal” time (100% = 2 years for an Associates degree). The narrative provided beneath each of the charts provides further details in order to understand the data. This data tool is an extremely ambitious project and there is strong need for this kind of compilation across the myriad of sources that can influence the direction of community college curriculum, policies and actions. But there are some weaknesses, especially at the state-level information which is either missing all together or incomplete, according to the Chronicle’s author, Max Lewontin, in the article from October 22, 2014. 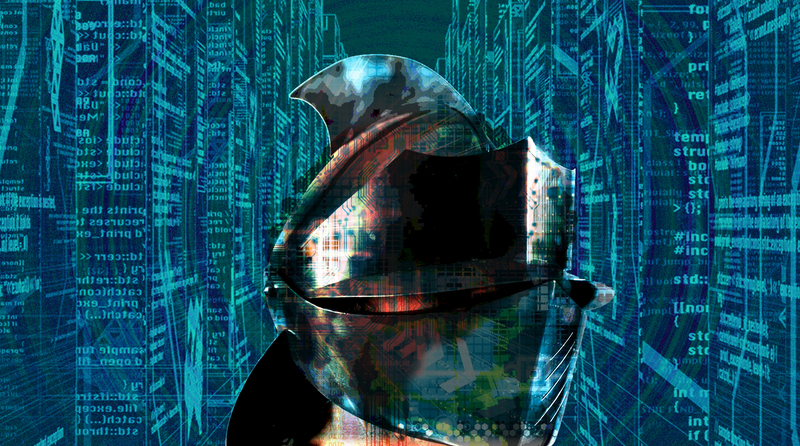 Although the tool was originally launched in 2012, it has been expanded and the future vision includes possibly allowing community colleges to add their own data to the system. There is a lot of potential to this tool if the data can be compiled with more depth. It is definitely worth looking at, and could even be an interesting tool to discuss with your students on the use of data in decision-making. And the Chronicle article here.